First of 18 new cars or derivatives to be announced under the Track25 business plan. McLaren Automotive reveals the stunning, streamlined form and sensational specification of the McLaren Speedtail. The next chapter in McLaren’s Ultimate Series, the Speedtail is the first ‘Hyper-GT’ from the pioneering British company recognised for producing luxury sportscars and supercars that deliver extraordinary driving experiences. The Speedtail can achieve the highest maximum speed of any McLaren to date, reaching 403 km/h (250mph), yet will also deliver an unprecedented blend of contemporary craftsmanship, materials innovation and bespoke personalisation. Just 106* will be created and all are already reserved, at a price from £1.75 million plus taxes. enjoyed in any other car. The driver is positioned centrally in the luxurious cockpit, with seating for two additional passengers set slightly rearwards. There is luggage space within both the nose and tail of the vehicle and a bespoke luggage set is available to every owner, the carbon fibre, leather and metalwork on the cases being matched to the interior specification of their Speedtail. The essence of the McLaren Speedtail is modern design and craftsmanship in the truest sense, the breathtakingly sophisticated shape having been brought to life using the very latest digital development technologies. By radically rethinking every aspect of the exterior design and drastically reducing weight, aerodynamic drag efficiency was maximised, acceleration improved and top speed increased. Elegance has been created through reduction: every body panel is carbon fibre and has been sculpted to reduce drag; retractable digital rear-view cameras replace traditional door mirrors to further aid aerodynamic performance; carbon fibre front-wheel static aero covers reduce air turbulence around the wheelarches; and the seamless silhouette is enhanced by a reduction in the number of shutlines – including a one-piece rear clamshell – which disrupt neither the visual continuity of the body or the flow of air over it. The patented active rear ailerons ensure the continuity of the design remains uncompromised, with drag kept to a minimum. Every element and every aspect of the McLaren Speedtail has been considered in the mission to reduce drag and maximise top speed. The McLaren Speedtail is narrower than a McLaren P1™, but more than half a metre longer, measuring 5,137mm (almost 17 feet) from nose to tail. The purity of form is remarkable: viewed from above, the McLaren Speedtail is essentially a teardrop – the fastest shape in nature – and this sculpted form creates the smoothest initial contact with the air at the front splitter, while the dramatically elongated tail bleeds off the flow to reduce turbulence. And not only is the overall shape a teardrop, but so too is the cockpit glasshouse set within the body, once again benefitting aerodynamic drag efficiency. The vertical ducts beneath the full LED headlights, for instance, are particularly slender, their form meticulously tapered to minimise drag while still feeding sufficient cooling air into the LTRs (Low-Temperature Radiators). Airflow that doesn’t enter the LTR ducts is directed over the bonnet of the Speedtail and enters two discreet upper front clam intakes. From here, it is ducted through the body and around the wheelarch before exiting out of the lower door vents. This engineering detail reduces the volume of air traveling around the side of the vehicle, which is prone to separation from the body and resulting turbulence. stop light – curve down into the engine cover before disappearing from view; a shorter, more aggressive intake would cause the air to separate from the surface and pass over the intake. the wheels rotate, the flat surface smoothing airflow around what would otherwise be a turbulent aerodynamic area. Typically, the revolution of a wheel drives air away from the vehicle, but the carbon fibre front-wheel static aero covers keep the air ‘attached’ to the car and guide it onwards to the door blades on the leading edge of the dihedral doors. The static wheel covers work in conjunction with multiple ducts and air paths to reduce turbulent air within the wheelarches. As air passes out of the LTRs, for instance, it is vented into the front wheelarches. From there – together with heat energy generated by the lightweight, carbon ceramic braking system – the air is channeled through the ducts in the fixed front wheel aero cover in a consistent flow pattern. Pressure within the wheelarches is also reduced via the lower door vents, which draw the turbulent air created by the rotating front wheels out of the arches and drive it smoothly along the sides of the McLaren Speedtail. The wheels themselves are finished in an elegant gloss black, with diamond-cut finishing. Brake calipers in Speedtail Silver complement the lustrous body colour. Super Series and McLaren Senna, intakes for the HTRs (High-Temperature Radiators) are mounted on the shoulders of the Speedtail, within the double-skinned dihedral doors. The raised front wings, compact cockpit glasshouse and flush glazing serves to keep the airflow attached to the vehicle, and drive it over the front fenders and into the deep channels within the doors to provide cooling for the 1,050PS hybrid powertrain. Such is the efficiency of this solution that the HTR intakes of the McLaren Speedtail are particularly compact, further minimising drag. a tolerance of only 1mm between the surfaces, this dramatic new technology all but removes any gaps or shutlines between the vehicle and the leading edge of the spoilers, meaning there is no turbulent air, no drag and no loss of speed. Positioned outboard from the centre of the Speedtail for optimal aerodynamic performance, the twin active ailerons adjust to move the centre of pressure and provide the required level of downforce precisely when it is needed most, for instance under deceleration to provide an airbrake function, while at high speed to increase vehicle stability. A Speedtail driver’s seat is positioned – literally – at the centre of the cockpit. This creates an unparalleled sense of space and a perfectly balanced view out of the windscreen. The custom-made carbon fibre seat, inspired by the seat of the iconic McLaren F1, offers the support and comfort appropriate for a ‘Hyper-GT’ car. Entry into this very special driving position is aided by a newly created directional leather finish that makes it easy to slide into the seat but then subtly holds the occupant in place while they drive. The central seat is flanked by two passenger seats that are integral to the carbon fibre monocoque. Ahead of the driver is a state-of-the-art control system, with high-definition displays and touchscreens that sweep across the dashboard and remove almost every button and switch traditionally found in a car. The controls to start the engine, turn on the Active Dynamics Panel and engage Velocity mode – as well as those to open the windows and doors – are in panels above the driver’s head. These controls and the other switches and dials are milled from aluminium, and then hand-brushed and polished. push the boundaries of design into a new era. The elegance and material excellence is more akin to high fashion, luxury yachts and bespoke furniture than is normally seen within an automotive environment. The scope for personalisation is extraordinary and every Speedtail will be unique to its owner. with carbon fibre, a material that McLaren has pioneered for nearly four decades, with every road or race car it has built since 1981 having a strong, stiff and light composite structure at its core. The Speedtail marks a revolutionary advance in the creation and usage of carbon by McLaren, with state-of-the-art technologies combining with traditional Italian textile knowledge to conceive a ‘digital loom’ process that delivers an even lighter composite material formed from an intricate carbon fibre weave. Pursuing further innovation, McLaren utilised this digital loom technique to develop a unique carbon fibre and titanium weave, christened Titanium Deposition Carbon Fibre. Traditional methods to change the colour of carbon fibre can compromise the material’s structural integrity and visual clarity; for the Speedtail, a micron-thin layer of titanium is fused directly onto the weave and becomes an integral part of the carbon fibre’s construction. The titanium deposition process maintains immense strength and low weight and creates a truly remarkable finish of visual carbon fibre with a chrome-effect shimmer. The front splitter, diffuser and side skirts are all finished in 1K Titanium Deposition Carbon Fibre. This material has just 1000 fibres per thread, making it lighter than the 3K alternative and allowing the adoption of a Jacquard weaving process to create an intricate, bespoke pattern in the Visual Carbon Fibre elements. The titanium can additionally be anodised in any bespoke colour or used to create interwoven images, symbols or even words within the carbon – for example, the rear of the driver’s seat features the McLaren logo. Working in collaboration with expert Swiss watchmaker, Richard Mille, McLaren used pioneering horology techniques to develop a world-first in the automotive sector: Thin-Ply Technology Carbon Fibre (TPT). The material is comprised of countless ultra-thin carbon layers just 30 microns in depth, each positioned at a 45° angle. The surface is then delicately milled to expose a stratified, shimmering construction that resembles flowing water. 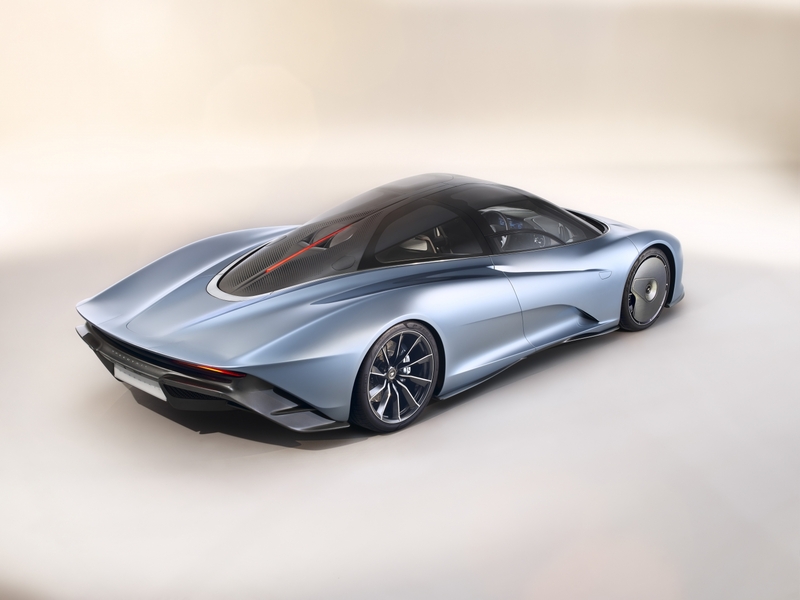 This fusion of cutting-edge technology and design with precision engineering is truly unique, and can be integrated into areas of the Speedtail such as the overhead control panel, gearshift paddles and steering wheel clasp. TPT is also used in the McLaren badge on the front of the Speedtail design model, with both this badge and the Speedtail name formed in 18-carat white gold, the letters being individually pressed, clipped and polished. Speedtail design model is trimmed in Dark Glacier and Cool White leathers, the former a full aniline material and the latter a new, semi-aniline lightweight leather, developed by the Bridge of Weir Leather Company. The luxurious thickness and supple finish of the leather – the result of using only the finest hides sourced from the best heritage breeds, combined with generations of hand-finished craftsmanship – is unaffected, but by infusing air beneath the surface during the manufacturing process, material density is reduced and the weight cut by 30 per cent. The result is proof that luxury can go hand-in-hand with lightweighting. The lightweight leather can be treated to render it resilient enough to line the floor of the Speedtail and finished in the colour or colours of the owner’s choice; in the design model, Dark Glacier and Black have been selected. The leather then extends in a continuous piece to provide covers for the storage compartments beneath the seats, McLaren’s designers drawing on the natural traits of the leather and its inherent rigidity to allow the compartments to open like a piece of luxury luggage. Specially selected Scandinavian hides are used for the full-aniline leather that trims the dashboard and passenger seats. Unblemished and virtually unchanged from its natural state, this leather is the result of a five-week tanning process using vegetable oils the only addition is the chosen colour – in the case of the passenger seats, Dark Glacier – producing a rare automotive material of truly exceptional quality. The finish of the rich leather is almost impossibly soft to the touch and like the grain of a tree or a human fingerprint, the individual patina of the hide is preserved so that every surface is utterly unique in character. Speedtail owners can additionally select unique stitch patterns in whichever colour they wish and bespoke decorative forms can be created within the leather through digital quilting or unique debossed or embossed patterns. Inspired by the finest of furniture and fashion design, the trimmed edges of the leather can even be painted, the colour being hand-mixed, hand-painted and then hand-polished to elevate the leather craftsmanship to the highest possible level and deliver an uncompromised aesthetic. materials design into unchartered territory and owners will experience an unprecedented journey of vehicle personalisation, leading up to the beginning of 2020 when the first deliveries of this rarest of Ultimate Series McLaren will take place. كشفت شركة ماكلارين أتوموتيڤ النقاب عن سيارتها المذهلة ماكلارين Speedtail ذات التصميم الانسيابي السلس والمواصفات الفريدة من نوعها. وتشكل السيارة الجديدة بداية فصلٍ جديد في Ultimate Series من ماكلارين، حيث تعد أول Hyper-GT من الشركة البريطانية الرائدة في مجال تصنيع السيارات الرياضية الفاخرة والسيارات الخارقة والتي توفر تجارب قيادة فريدة من نوعها. وتمتاز Speedtail بقدرتها على الوصول إلى أعلى سرعة قصوى، لتتفوق حتى الآن على أي من سيارات ماكلارين، والتي تبلغ 403 كيلومترات في الساعة (250 ميلاً في الساعة)، فضلاً عن تزويدها بمزيج غير مسبوق من اللمسات المتقنة والحديثة والمواد المبتكرة والخواص المصممة حسب الطلب. ومن المقرر إنتاج 106 سيارات* فقط من هذا النموذج - وجرى حجزها جميعاً بسعر يبدأ من 1.75 مليون جنيه استرليني بالإضافة للضرائب. "لم يسبق لشركة ماكلارين وأن أنتجت أي سيارة تشابه سيارة Speedtail حتى الآن. وباعتبارها أولى سيارات ماكلارين المخصصة للطرقات من فئة Hyper-GT، تدمج سيارة Speedtail في تصاميمها اللمسات الفنية الرفعية مع أحدث ابتكارات العلم، حيث تجمع السرعة الفائقة مع وضعية القيادة المركزية، فضلاً عن طابعها الفريد والمصمم حسب الطلب. وتم تركيب نظام نقل الحركة الهجين للسيارة ضمن هيكلها خفيف الوزن والمصنوع من ألياف الكربون، والتصاميم الانسيابية للسيارات التي حطّمت الكثير من الأرقام القياسية في الماضي، في حين توفر مقصورة السائق الفاخرة والمكونة من 3 مقاعد تجارب قيادة مذهلة ومستويات لا تضاهى من التفرد ومواد مبتكرة لم يسبق استخدامها من قبل في السيارات المخصصة للطرقات". مايك فليويت، الرئيس التنفيذي لشركة ماكلارين أتوموتيڤ. وتوفر مجموعة نقل الحركة الهجينة زيادة كبيرة في سرعة السيارة بصرف النظر عن عدد دورات المحرك بالدقيقة، في حين يسهم الوزن الخفيف للسيارة - والبالغ 1430 كيلو جرام - في زيادة سرعة السيارة. وترسي سرعة سيارة Speedtail على الطرقات المستقيمة معايير جديدة بالنسبة لسيارات ماكلارين، حيث يمكن للسيارة الانطلاق من وضعية الوقوف بسرعة 300 كيلومتراً بالساعة خلال 12.8 ثانية فقط؛ بينما تحتاج سيارة ماكلارين ™P1، وهي النسخة السابقة من سلسلة Ultimate Series، إلى 16.5 ثانية لبلوغ هذه السرعة. كما تم تصميم إطارات ™ P-ZEROخصيصاً لمنح سيارة Speedtail سرعتها الفائقة، وذلك من قبل شريك McLaren Technology شركة بيريللي. من ناحية أخرى، تم توجيه الدعوة إلى العملاء الذين قاموا بالحجز سيارات Speedtail للقدوم والاطلاع على نموذج السيارة الجديدة خلال فعالية خاصة أقيمت مؤخراً في العاصمة البريطانية لندن. وتم خلال الفعالية عرض سيارة Speedtail Silver المطلية باللون الفضي، وهو عبارة عن طلاء نانو يحمل مؤثرات المعدن السائل والذي طورته ماكلارين خصيصاً لهذه السيارة، إلى جانب استخدام جلد الأنيلين - المدبوغ بمواد دباغة مذابة للحفاظ على المظهر الطبيعي للجلود - وأنواع جديدة من الجلود خفيفة الوزن. بينما تعكس مقصورة السائق لمحات وافية حول المعايير الرفيعة من ناحية إتاحة فرص اختيار التصاميم لكل واحدة من سيارات Speedtail بما يتلاءم مع ذوق مالكها، والتي يتيحها قسم العمليات الخاصة في شركة ماكلارين المسؤول عن مهمات تصميم السيارات وفق طلب العملاء؛ ما يضمن على نحو تامّ عدم إنتاج نسختين متطابقتين من هذا الطراز. "باعتبارها إحدى طرازت Ultimate Series التي تعكس قمة الإتقان في سيارات ماكلارين، ترتقي سيارة Speedtail بالإمكانات التقنية نحو مستويات جديدة كلياً؛ إذ تجسّد هذه السيارة المذهلة أحدث التقنيات المتعلقة بالديناميكية الهوائية وخفة الوزن على نحو يماثل سيارة ماكلارين Senna، إلا أن الهدف من هذا الطراز الجديد يتمثل في تحقيق مستويات جديدة من التصميم المتقن وتقليل الوزن بهدف تخفيف مقاومة الهواء إلى أقصى درجة، وتوفير قدرة تسارع تختطف الأنفاس وسرعات لا مثيل لها". آندي بالمر، مدير خط إنتاج سيارات Ultimate Series في شركة ماكلارين أوتوموتيڤ. إضفاء مظهر أنيق على السيارة من خلال تخفيف وزنها: تم تصنيع جميع ألواح الهيكل من ألياف الكربون وصقلها على النحو الأمثل بغية الحد من مقاومة الدفع، إلى جانب تزويد السيارة بكاميرات رقمية للرؤية الخلفية قابلة للإغلاق والاستعاضة بها عن المرايا الزجاجية التقليدية في الأبواب لتعزيز مستويات أداء الديناميكية الهوائية، وتزويد العجلتين الأماميتين بأغطية ثابتة ومصنوعة من ألياف الكربون للحد من الاحتكاك مع الهواء في محيط أقواس العجلات، فضلاً عن تعزيز الطابع الانسيابي للسيارة عبر خفض عدد الفتحات في هيكلها - بما في ذلك الغطاء الخلفي للسيارة والمكونة من قطعة واحدة - والتي لا تؤثر على المظهر الانسيابي للسيارة، ولا تعيق مرور الهواء فوقها. بينما يحافظ الجناح الخلفي للسيارة على سلاسة المظهر الانسيابي وخفض مقاومة الهواء إلى حدها الأدنى. وتراعي سيارة ماكلارين Speedtail جميع العناصر والجوانب التي تسهم في خفض مقاومة الهواء وزيادة السرعة إلى أقصى حد ممكن. ويقل عرض سيارة ماكلارين Speedtail عن شبيهتها ماكلارين ™P1، ولكنها تزيد عنها طولاً بمقدار نصف متر حيث يبلغ من طول السيارة من المقدمة إلى المؤخرة 5.137 متر (حوالي 17 قدم). مظهر نقي ومذهل: عند النظر إليها من الأعلى، تشابه سيارة ماكلارين Speedtail في تصميمها قطرة الماء - وهو الشكل الانسيابي الأكثر سرعة في الطبيعة - ويوفر هذا المظهر المصقول تماساً أولياً سلساً مع الهواء في مقدمة السيارة، في حين ينزلق الهواء بكل سهولة عن مؤخرة السيارة لخفض مستويات الاهتزاز إلى أقصى حد ممكن. ولا يقتصر مظهر قطرة الماء على الهيكل الخارحي، وإنما علىمقصورة السائق الزجاجية والتي تستفيد بدورها من الكفاءة الأيروديناميكية. ويتم الحفاظ على التدفق المطلوب للهواء ضمن نظام نقل الحركة من خلال منفذين يميلان إلى الأسفل، وتقع فتحتيهما خلف الغطاء الزجاجي مباشرة. ويتجه منفذا الهواء - اللذان يفصلهما ضوء التوقف المركزي العلوي -بشكل منحنٍ إلى الأسفل نحو غطاء المحرك قبل أن يختفيا عن نطاق الرؤية. وتم تصميمهما على هذا النحو لأن استخدام منافذ هواء أقصر وأكبر حجماً يمكن أن يتسبب بانفصال الهواء عن السطح والمرور عبر منفذ الهواء. وتعمل الأغطية الثابتة للعجلات الأمامية على نحو متناسق مع القنوات والمسارات الهوائية المتعددة لخفض مستويات مقاومة الهواء ضمن أقواس العجلات. وبينما يتدفق الهواء عبر مشعات التبريد، على سبيل المثال، فإنه يخرج نحو أقواس العجلات الأمامية. ومن هذه النقطة - وإلى جانب الحرارة المتولدة عن نظام التعليق خفيف الوزن والمصنوع من سيراميك الكربون - يتم توجيه الهواء عبر القنوات ضمن الأغطية الثابتة للعجلات الأمامية وفق نمط تدفق ثابت. كما يتم تخفيف الضغط على أقواس العجلات من خلال منافذ الهواء أسفل الأبواب، والتي تقوم بتبديد الاضطراب الهوائي الناجم عن دوران العجلات الأمامية بعيداً عن أقواس العجلات، وتوجيهه بكل سلاسة نحو جانبي سيارة ماكلارين Speedtail. وتم تصميم العجلات نفسها بلون أسود أنيق وتشطيبات ألماسية، في حين تتكامل ملاقط الفرامل في سيارة Speedtail Silver على النحو الأمثل مع المظهر اللامع لهيكل السيارة. ويعمل موزع الهواء الخلفي في سيارة ماكلارين Speedtail بالتزامن مع شفرات الأجنحة الخلفية لتقليص الضغط الأساسي ومقاومة الدفع، وذلك من خلال الاندماج السلس للهواء المتدفق من أعلى وأسفل السيارة. وتتحد وظيفة موزع الهواء ذو القنوات الطويلة مع السطح السفلي المستوى للسيارة - على نحو ينسجم مع السطح الخلفي الواسع لهيكل السيارة - لتوزيع الهواء قبل تحويله تدريجياً نحو الخلف ليصبح تدفقاً هوائياً حراً بدلاً من تشتيته عن الجانب الخلفي للسيارة بشكل قوي ومفاجئ. ويفضي ذلك بنهاية المطاف إلى تحسين كفاءة الديناميكية الهوائية. "تنفرد سيارة ماكلارين Speedtail بتصميمها المذهل والذي لا تضاهيه أي سيارة أخرى. ولا يرجع ذلك إلى مظهرها الرائع وسرعتها الفائقة وكفاءتها العالية من ناحية الديناميكية الهوائية فحسب، وإنما لكونها ترسي معايير جديدة كلياً على صعيد الفخامة التقنية والتصميم حسب الطلب. وقد دفعتنا المستويات الرفيعة ذاتها من الابتكار والإبداع - والتي قادت ماكلارين للارتقاء بسوية الأداء الفعلي لسياراتها إلى تقديم تصاميم داخلية مذهلة، فضلاً عن الارتقاء بسوية الجودة في المواد المستخدمة". روب ميلڤيل، رئيس قسم التصميم في شركة ماكلارين أتوموتيڤ. وتستهل ماكلارين رؤيتها الخاصة بسيارة Speedtail- والمتمثلة في تقديم أفضل التصاميم المصممة حسب رغبات العملاء في سيارتها- باستخدام ألياف الكربون، وهي مادة أتقنت ماكلارين استخدامها منذ 4 عقود في جميع السيارات المخصصة للسباقات أو الطرقات، والتي قامت بإنتاجها منذ عام 1981 بهدف إضفاء طابع فريد من الصلابة والمتانة وخفة الوزن كعنصر أساسي في تركيبة هيكلها. وتجسد سيارة Speedtail في مضمونها النقلة النوعية التي نجحت ماكلارين بإحرازها في مجال الابتكار والمهارة العالية باستخدام ألياف الكربون، وذلك بفضل التقنيات فائقة التطور والتي تتكامل مع الخبرات الإيطالية الواسعة في مجال الأنسجة والتي أفضت إلى ابتكار تقنية "digital loom" لإنتاج مواد خفيفة الوزن ومصنوعة من نسيج ألياف الكربون. وسعياً منها لتعزيز الابتكار، وظفت ماكلارين تقنية "digital loom" لتطوير ألياف كربون وأنسجة تيتانيوم فريدة من نوعها أطلقت عليها اسم أنسجة Titanium Deposition Carbon Fibre. ويمكن للوسائل التقليدية المتبعة في تغيير ألياف الكربون أن تؤدي إلى تخريب بنية المادة ووضوحها البصري. أما في سيارة Speedtail، فيتم دمج طبقة رقيقة من التيتانيوم بشكل مباشر إلى النسيج بحيث تصبح جزءاً أساسياً من ألياف الكربون. وتحافظ عملية دمج التيتانيوم على المتانة العالية والوزن الخفيف للنسيج، كما تمنح ألياف الكربون مظهراً مذهلاً مع إضفاء تأثيرات لونية تماثل تألق معدن الكروم. وتمت تغطية مشتت الهواء الأمامي وموزع الهواء والعتبات الجانبية جميعاً بكيلوجرام واحد فقط من أنسجة Titanium Deposition Carbon Fibre. وتتكون هذه المادة من 1000 وحدة فقط من الألياف في كل خيط، ما يجعلها أقل وزناً بمقدار 3 كيلوجرامات من المواد البديلة، وبالتالي فإنها تتيح إمكانية استخدام أنسجة الجاكارد لإنشاء أنماط معقدة ومصممة حسب الطلب للعناصر المكونة من ألياف الكربون البصرية. ويمكن طلاء التيتانيوم بأي لون وحسب الطلب، أو استخدامه لابتكار صور أو رموز أو أحرف منسوجة ضمن الكربون - فعلى سبيل المثال، تم رسم شعار ماكلارين على الجانب الخلفي لمقعد السائق. وتم تصميم المقصورة الداخلية بأكملها في سيارة Speedtail لمنح السائق والركاب شعوراً بالحميمية، وذلك باستخدام أفخر الجلود التي تغطي جميع الأسطح الداخلية تقريباً. ويزدان تصميم مقعد السائق في السيارة بجلود Dark Glacier و Cool White ، حيث تتكون الأولى من جلود الأنيلين الكاملة بينما تتألف الثانية الأخيرة من نوعٍ جديد وخفيف الوزن وشبيهاً بجلود الأنيلين، والتي طورتها شركة Bridge of Weir Leather. ولا تتأثر سماكة الجلد وليونته الفائقة - والتي تنتج عن استخدام أفضل أنواع الجلود التي يتم توريدها من أفضل السلالات الحيوانية، إلى جانب الخبرات الواسعة والممتدة لأجيال في مجال التصنيع اليدوي المتقن - بعمليات التصنيع. ولكن من خلال نفخ الهواء تحت سطح الجلد أثناء عملية التصنيع، يتم خفض كثافة الجلود وإنقاص وزنها بنسبة 30%. ويتمخض عن ذلك كله دليل ساطع على إمكانية أن تترافق الفخامة مع خفة الوزن. وتم اختيار تشكيلة مختارة من الجلود الاسكندنافية لتصنيع جلود الأنيلين الكاملة التي تغطي لوحة القيادة ومقاعد الركاب. ويتم إنتاج هذه الجلود، الخالية من العيوب والتي تحافظ على حالتها الطبيعية، من خلال عملية دباغة متقنة تستمر لخمسة أسابيع وتُستخدم فيها الزيوت النباتية. وتتمثل الإضافة الوحيدة عليها في اختيار الألوان - كما هو الحال في استخدام جلود Dark Glacier الداكنة في مقاعد الركاب -، وبذلك يتم إنتاج المكونات النادرة للسيارة بجودة استثنائية لا تضاهى. وتمتاز الجلود الناتجة عن هذه العملية بنعومتها الفائقة والتي تماثل نعومة الخشب المصقول أو بصمة الإصبع البشرية، ويتم الحفاظ على المظهر الطبيعي الخاص لكل قطعة من الجلود وبذلك تحتفظ أسطحها بطابعها المتفرد. وللمزيد من المعلومات حول McLaren Speedtail وفيلم عن شكل وتفاصيل السيارة يرجى زيارة الرابط التالي: cars.mclaren.com/ultimate-series/mclaren-speedtail.